Community Fires » Why Fire? Fire has come to us to bring us back into a full relationship with all the living world and back into community with all our human relatives. Fire leads us to a full life. To receive these benefits, as human beings have since the beginning of time, we sit around the fire to rekindle our relationship with the hottest element’s primal form, the one that we see burning in our fire pits. Then as we warm to that, we begin to feel the energy of fire working in our daily lives: in our flow of emotions, our feelings, our relationships, and our listening to the world around us. We begin having a deeper connection to Fire’s expression, the energy of Heart. The world starts to open up to us, and we start to open up to the experience of the world. This opening brings less control…..and more acceptance. Generally, our lives are already full…of being busy, sometimes overwhelmed, sometimes stressed out, and often lacking balance and the real warmth of connection. Could it be that we have forgotten who we are and how to listen? Heart is the great antidote for the busy-ness and fears of the mind. In everyday life, we tend to get lost, drifting in our mind and thinking, and we forget how to listen to our heart, which holds our knowing and wisdom. The heart can connect us to our path, to the next step we should take. It is always present, but hard for us to hear when we’re so busy in the mind. 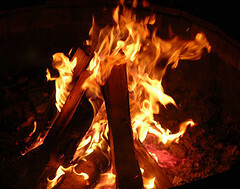 Community Fires help us to rediscover and hear the voice of Heart more and more in our lives. Fire is also seen as the energy of connection. There are still many people on the planet that live in a sense of true connection and communication with the world around them; they experience being part of it. When we are lost in the mind, we lose that sense of being connected and substitute the sense of being individual and separate. We often feel disconnected from each other, from nature, from our inner spirit. Fire is the great connective energy, connecting us to others, to the living world, to spirit, to our path. As the energy of fire is accentuated at our fires, so is the possibility to connect more deeply, even to that timeless place within. Read more in The Story of Fire. Learn more about Community Fires. Community fires and ritual space.